Perhaps the best known evaluation methodology for judging learning processes is Donald Kirkpatrick's Four Level Evaluation Model that was first published in a series of articles in 1959 in the Journal of American Society of Training Directors (now known as T+D Magazine). The series was later compiled and published as an article, Techniques for Evaluating Training Programs, in a book Kirkpatrick edited, Evaluating Training Programs (1975). However it was not until his 1994 book was published, Evaluating Training Programs, that the four levels became popular. Nowadays, his four levels remain a cornerstone in the learning industry. While most people refer to the four criteria for evaluating learning processes as “levels,” Kirkpatrick never used that term, he normally called them “steps” (Craig, 1996). In addition, he did not call it a model, but used words such as, “techniques for conducting the evaluation” (Craig, 1996). Step 1: Reaction - How well did the learners like the learning process? Step 4: Results - What are the tangible results of the learning process in terms of reduced cost, improved quality, increased production, efficiency, etc.? Kirkpatrick's concept is quite important as it makes an excellent planning, evaluating, and troubling-shooting tool, especially if we make some slight improvements as show below. While some mistakenly assume the four levels are only for training processes, the model can be used for other learning processes. For example, the Human Resource Development (HRD) profession is concerned with not only helping to develop formal learning, such as training, but other forms, such as informal learning, development, and education (Nadler, 1984). Their handbook, edited by one of the founders of HRD, Leonard Nadler (1984), uses Kirkpatrick's four levels as one of their main evaluation models. Kirkpatrick himself wrote, “These objectives [referring to his article] will be related to in-house classroom programs, one of the most common forms of training. Many of the principles and procedures applies to all kinds of training activities, such as performance review, participation in outside programs, programmed instruction, and the reading of selected books” (Craig, 1996, p294). When a learner goes through a learning process, such as an e-learning course, informal learning episode, or using a job performance aid, the learner has to make a decision as to whether he or she will pay attention to it. If the goal or task is judged as important and doable, then the learner is normally motivated to engage in it (Markus, Ruvolo, 1990). However, if the task is presented as low-relevance or there is a low probability of success, then a negative effect is generated and motivation for task engagement is low. In addition, research on reaction evaluations generally show that it is not a valid measurement for success (see the last section, Criticisms). This differs from Kirkpatrick (1996) who wrote that reaction was how well the learners liked a particular learning process. However, the less relevance the learning package is to a learner, then the more effort that has to be put into the design and presentation of the learning package. That is, if it is not relevant to the learner, then the learning process has to hook the learner through slick design, humor, games, etc. This is not to say that design, humor, or games are unimportant; however, their use in a learning process should be to promote or aid the learning process rather than just make it fun. And if a learning package is built of sound purpose and design, then it should support the learners in bridging a performance gap. Hence, they should be motivated to learn—if not, something dreadfully went wrong during the planning and design processes! If you find yourself having to hook the learners through slick design, then you probably need to reevaluate the purpose of your learning processes. As Gilbert noted (1998), performance is a better objective than behavior because performance has two aspects: behavior being the means and its consequence being the end . . . and it is the end we are mostly concerned about. Result - What impact (outcome or result) will improve our business? Performance - What do the employees have to perform in order to create the desired impact? The revised model can now be used for planning (left column) and evaluation (right column). In addition, it aids the troubling-shooting process. the initial premise that the skills selected for training would bring about change is wrong. 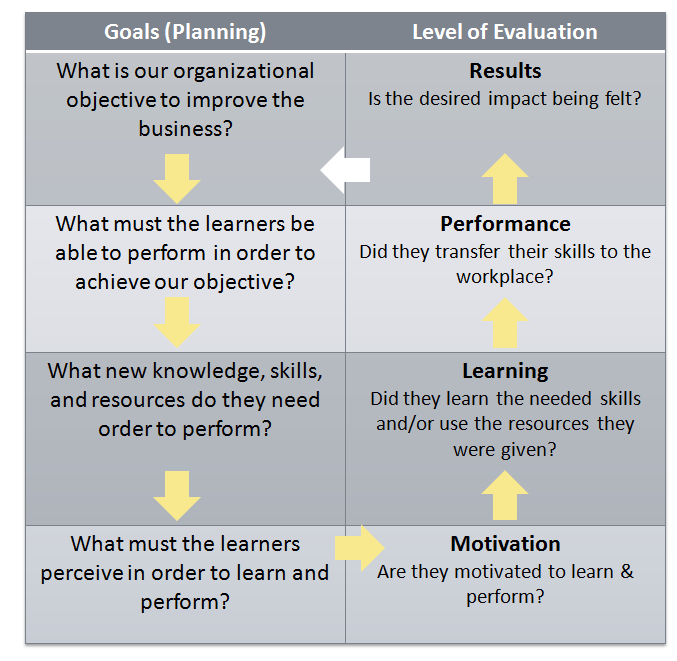 As the above diagram shows, the Results evaluation is of the most interest to the business leaders, while the other three evaluations (performance, learning, and motivation) are essential to the learning designers for planning and evaluating their learning processes; of course the Results evaluation is also important to them as it gives them a goal for improving the business. For more information, see Formative and Summative Evaluations. Results or Impact measures the effectiveness of the initiative. Although it is normally more difficult and time-consuming to perform than the other three levels, it provides information that is of increasingly significant value as it proves the worth of a learning and performance process. However, using the Revised Evaluation model that is shown above should ease the process, as you will now have a clear picture of what you are trying to achieve. That is, when you plan for something then you more readily understand how to evaluate it. Motivation, Learning, and Performance are largely soft measurements; however, decision-makers who approve such learning processes prefer results (returns or impacts). Jack Phillips (1996), who probably knows Kirkpatrick's four levels better than anyone else does, writes that the value of information becomes greater as we go from motivation to results. The motivation evaluation informs you how relevant the learning process is to the learners (it measures how well the learning analysis processes worked). You may have all the other levels correct, but if the learners do not see a purpose for learning and performing, then they probably won't perform it. The Learning evaluation informs you to the degree of relevance that the learning process worked to transfer the new skills to the learners (it measures how well the design and development processes worked). The performance evaluation informs you of the degree that their skills actually transferred to their job (it measures how well the performance analysis process worked). 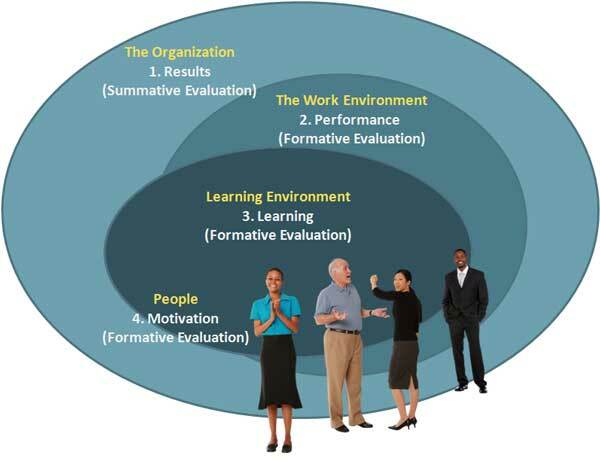 The results evaluation informs you of the return the organization receives from supporting the learning process. Decision-makers normally prefer this harder result, although not necessarily in dollars and cents. For example, a study of financial and information technology executives found that they consider both hard and soft returns when it comes to customer-centric technologies, but give more weight to non-financial metrics (soft), such as customer satisfaction and loyalty (Hayes, 2003). 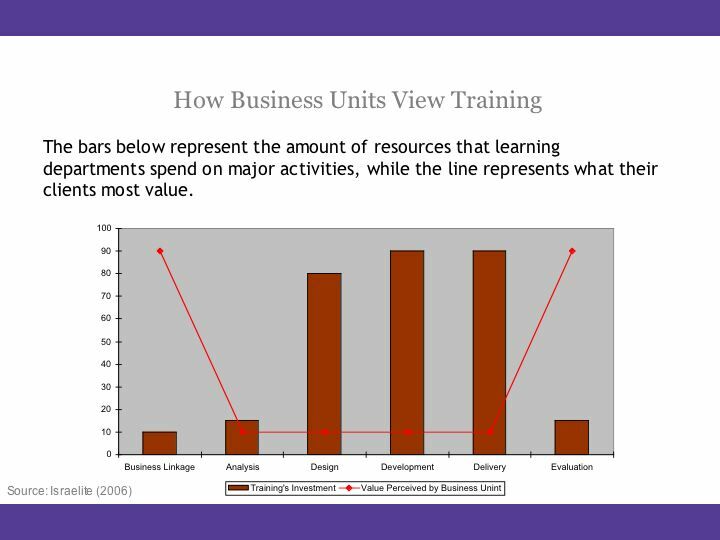 Note the difference in “information” and “returns.” Motivation, Learning, and Result measurements give you information for improving and evaluating the learning process, which mostly concerns the learning designers; while the Results measurement gives you the returns for investing in the learning process, which mostly concerns the business leaders. Financial: A measurement, such as an ROI, that shows a monetary return, or the impact itself, such as how the output is affected. Financial can be either soft or hard results. Customer: Improving an area in which the organization differentiates itself from competitors to attract, retain, and deepen relationships with its targeted customers. Internal: Achieve excellence by improving such processes as supply-chain management, production process, or support process. Innovation and Learning: Ensuring the learning package supports a climate for organizational change, innovation, and the growth of individuals. It is important to measure performance because the primary purpose of learning in the organization is to improve results by having its people learn new skills and knowledge and then actually applying them to the job. Since performance measurements must take place when they are doing their work, the measurement will typically involve someone closely involved with the learner, such as a supervisor or a trained observer or interviewer. This is the extent to which learners improve knowledge, increase skill, and change attitudes as a result of participating in a learning process. The learning evaluation normally requires some type of post-testing to ascertain what skills were learned during the process and what skills they already had. What skills were developed or enhanced? Learner assessments are created to allow a judgment to be made about the learner's capability for performance. There are two parts to this process: the gathering of information or evidence (testing the learner) and the judging of the information (what does the data represent?). This assessment should not be confused with evaluation. Assessment is about the progress and achievements of the individual learners, while evaluation is about the learning program as a whole (Tovey, 1997). Assessment at this level measures how the learners perceive and react to the learning and performance process. This level is often measured with attitude questionnaires that are passed out after most training classes. Learners are often keenly aware of what they need to know to accomplish a task. If the learning process fails to satisfy their needs, a determination should be made as to whether it's the fault of the learning process design or the learners do not perceive the true benefits of the process. When a learning process is first presented, rather it be eLearning, mLearning, classroom training, a job performance aid, or through a social media tool, the learner has to make a decision as to whether he or she will pay attention to it. If the goal or task is judged as important and doable, then the learner is normally motivated to engage in it (Markus, Ruvolo, 1990). However, if the task is presented as low-relevance or there is a low probability of success, then a negative effect is generated and motivation for task engagement is low. There are three problematic assumptions of the Kirkpatrick model: 1) the levels are not arranged in ascending order, 2) the levels are not causally linked, and 3) the levels are positively inter-correlated (Alliger and Janak, 1989). The only part of Kirkpatrick's four levels that has failed to uphold to scrutiny over time is Reaction. For example, a Century 21 trainer with some of the lowest Level one scores was responsible for the highest performance outcomes post-training (level four), as measured by his graduates' productivity. This is not just an isolated incident—in study after study the evidence shows very little correlation between Reaction evaluations and how well people actually perform when they return to their job (Boehle, 2006). Kirkpatrick's four levels treat evaluation as an end of the process activity, whereas the objective should be to treat evaluation as an ongoing activity that should begin during the pre-learning phase. Actually, this criticism is inaccurate. For example, The ASTD Training & Development Handbook (1996), edited by Robert Craig, includes a chapter by Kirkpatrick with the simple title of “Evaluation.” In the chapter, Kirkpatrick discusses control groups before and after the training (such as pre and post-tests). He goes on to discuss that level four should also include a post-training appraisal three or more months after the learning process to ensure the learners put into practice what they have learned. Kirkpatrick further notes that he believes the evaluations should be included throughout the learning process by getting evaluations not only during each session or module, but also after each subject or topic. The four Levels are only for training process, rather than other forms of learning. So it might turn out that the best criticism is not leveled at the four levels themselves, but rather the way we use them when speaking to other business leaders. We tell the business units that the level-one evaluations show the learners were happy and that level two show they all passed the test with flying colors, and so on up the line. Yet according to the surveys that I have seen, results or impact is rarely used, which the business leaders most highly value. The other levels of evaluation can be quite useful within the design process as they help us to discuss what type of evaluation we are speaking about and pinpoint troubled areas. However, outside of the learning and development department they often fall flat. For the most part, the business leaders' main concern is the IMPACTdid the resources we spent on the learning process contribute to the overall health and prosperity of the enterprise? Alliger, G.M., Janak, E.A. (1989). Kirkpatrick's levels of training criteria: Thirty years later. Personnel Psychology, 42(2):331–342. Chyung, S.Y. (2008). Foundations of Instructional Performance Technology. Amherst, MA: HRD Press Inc.
Craig, R.L. (1996). The ASTD Training: Development Handbook. New York: McGraw-Hill, p294. Gilbert, T. (1998). A Leisurely Look at Worthy Performance. Woods, Gortada (eds). The 1998 ASTD Training and Performance Yearbook. New York: McGraw-Hill. Hayes, M. (2003). Just Who's Talking ROI? Information Week. Feb. 2003, p18. Kaplan, R.S., Norton, D.P. (2001). The Strategy-Focused Organization: How Balanced Scorecard Companies Thrive in the New Business Environment. Boston, MA: Harvard Business School Press. Kirkpatrick D.L. (1959). Techniques for evaluating training programs. Journal of American Society of Training Directors. 13(3): pp21–26. Kirkpatrick, D.L. (1975). Techniques for Evaluating Training Programs. Kirkpatrick (ed.). Evaluating training programs. Alexandria, VA: ASTD. Kirkpatrick, D.L. (1994). Evaluating Training Programs. San Francisco: Berrett-Koehler Publishers, Inc.
Markus, H., Ruvolo, A. (1990). Possible selves: Personalized representations of goals. Pervin (ed). Goal Concepts in Psychology. Hillsdale, NJ: Lawrence Erlbaum. pp 211–241. Nadler, L. (1984). The Handbook Of Human Resource Development. New York: John Wiley & Sons. Phillips, J. (1996). Measuring the Results of Training. The ASTD Training and Development Handbook. Craig, R. (ed.). New York: McGraw-Hill. Wick, C.W., Pollock, R.V.H., Jefferson, A.K., Flanagan, R.D. (2006). The Six Disciplines of Breakthrough Learning. San Francisco, CA: Pfeiffer. Updated October 5, 2015. Created July 13, 1995.